THIS LATEST ARRIVAL INTO OUR STOCK IS A BMW X1 XDRIVE 2.0 D SPORT 5-DOOR 141 BHP 6-SPEED MANUAL FINISHED IN MINERAL GREY METALLIC WHICH IS COMPLIMENTED BY THE ANTHRACITE MEDIAN CLOTH UPHOLSTERY, THE CAR COMES COMPLETE WITH A FULL BMW MAIN DEALER SERVICE HISTORY, THERE ARE FOUR STAMPS IN THE BOOK UPTO 31/12/2016 @ 29111 MILES. STANDARD SPECIFICATION ON THIS MUCH SOUGHT AFTER MODEL INCLUDES 18 INCH BLADE-SPOKE ALLOY WHEELS, FINE BRUSHED ALLUMINIUM INTERIOR TRIM, DRIVE PERFORMANCE CONTROL, SUN PROTECTION PACKAGE, RUN-FLAT TYRES, MULTI-FUNCTION STEERING WHEEL, BLUETOOTH CONNECTIVITY, REAR PARKING SENSORS, ELECTRIC WINDOWS, ELECTRIC MIRRORS, AUX PORT, USB PORT, DUAL ZONE CLIMATE CONTROL & IT HAS TWO SETS OF REMOTE KEY FOBS. Meet the Sports Activity Vehicle designed specifically for drivers who want to embrace life. Featuring beautiful yet rugged external styling, a spacious and refined interior, plus the capability to take all kinds of journeys in its stride, the X1 is in many ways the perfect family vehicle. 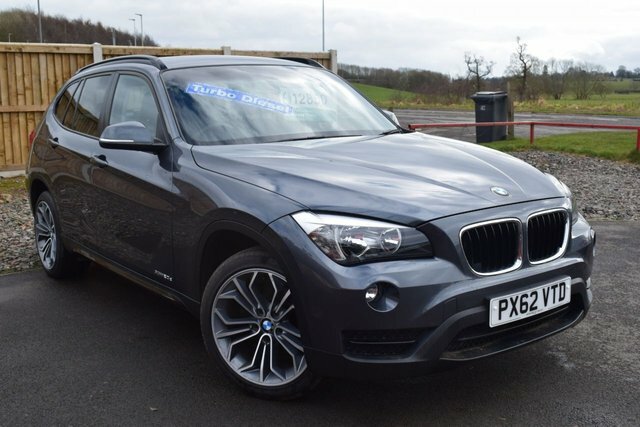 You can take a closer look at the range of used BMW X1 cars for sale in Penrith right now by paying a visit to Intercars of Penrith Ltd. Alternatively, take the opportunity to browse our complete stock of used cars here on the website before getting in touch with a member of the team for more details. Call, get in touch online or pay us a visit in person.